Posey County’s new jail and historic courthouse can now be connected to provide better and cheaper service to citizens. Sheriff Oeth may already have funds in the new jail budget to provide video conferencing between the jail and the courts. Sheriff Oeth and both Posey County judges have long been in favor of video conferencing. Perhaps this important public service can soon be in operation. The benefits are many and the cost is low. Savings of transportation costs and deputy time along with greatly enhanced security for the public are within reach. And since most of the persons lodged in our jail are awaiting court disposition and, therefore, presumed by law to be innocent, public humiliation experienced from orange jump suits, handcuffs, leg shackles and armed guards can be reduced. And while most cases where video conferencing can enhance justice will be local jail to courthouse matters, we have numerous matters where inmates in state and federal prisons could appear electronically and we sometimes could save a great deal of expert witness expense in both criminal and civil cases. For the Sheriff’s Department to institute video conferencing another major need is a location at the courthouse. 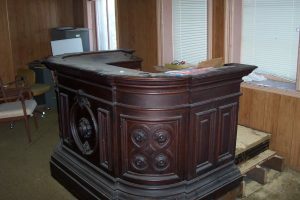 We now, with the requested assistance of the Posey County Board of Commissioners and County Council, are in the process of refurbishing a small courtroom in our 142-year-old courthouse for just such a purpose. 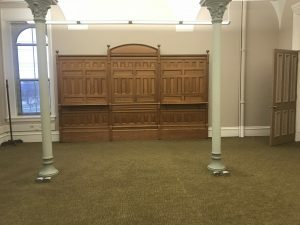 The photographs included with this article show the courtroom backdrop which was first used in 1893 and furniture from the 1825 courthouse that has been in the possession of the City of Mt. Vernon since 1893. Mayor Bill Curtis and the Mt. Vernon City Council have graciously returned these historic items for county use. A small courtroom on the first floor of our courthouse will open up numerous important possibilities for both public service and saving taxpayer funds. While I plan to concentrate on this newly modified space as a Magistrate’s Courtroom to ease the burdens and costs of family type cases, this revamped space can be used for conferences by attorneys, mediation, pre-trial conferences, weddings and extra seating when there is overflow in the courtroom on the second floor. Okay, we are ready for next week and the devil in the details of a Magistrate’s Court. Hang in there with me and maybe we can all do some good.